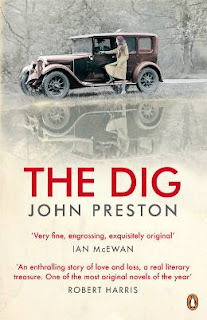 As the Guardian Hay Festival 2008 draws to a close it is worth drawing attention to John Preston's The Dig (Penguin 2007). This is set on the excavation of Sutton Hoo in the summer of 1939. In the long hot summer of 1939 Britain is preparing for war. But on a riverside farm in Suffolk there is excitement of another kind: Mrs Petty, the widowed farmer, has had her hunch proved correct that the strange mounds on her land hold buried treasure. As the dig proceeds against a background of mounting national anxiety, it becomes clear though that this is no ordinary find... And pretty soon the discovery leads to all kinds of jealousies and tensions. John Preston's recreation of the Sutton Hoo dig - the greatest Anglo-Saxon discovery ever in Britain - brilliantly and comically dramatizes three months of intense activity when locals fought outsiders, professionals thwarted amateurs, and love and rivaly flourished in equal measure. 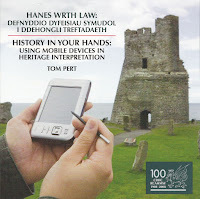 Listen to John Preston talking about The Dig on BBC's "Open Book". This should be of interest to some on this list. shared spaces & open paths to cultural content”. e) Theoretical approaches to cultural heritage and digital culture. Farmakis G., Chief Executive Officer, Agilis S.A.
notified by 30th June 2008.
us for any further enquiries. "Assessing the Future Landscape of Scholarly Communication: An In-depth Study of Faculty Needs and Ways of Meeting Them"
The Center for Studies in Higher Education, with generous funding from the Andrew W. Mellon Foundation, is conducting research to understand the needs and desires of faculty for in-progress scholarly communication (i.e., forms of communication employed as research is being executed) as well as archival publication. In the interest of developing a deeper understanding of how and why scholars do what they do to advance their fields, as well as their careers, our approach focuses on fine-grained analyses of faculty values and behaviors throughout the scholarly communication lifecycle, including sharing, collaborating, publishing, and engaging with the public. Well into our second year, we have posted a draft interim report describing some of our early results and impressions based on the responses of more than 150 interviewees in the fields of astrophysics, archaeology, biology, economics, history, music, and political science. more casual individual posting of working papers, blogs, and other non-peer-reviewed work). Our work suggests that enthusiasm for technology development and adoption should not be conflated with the hard reality of tenure and promotion requirements (including the needs and goals of final archival publication) in highly competitive professional environments. Here is the program (in Greek) for the launch presentation of the work accomplished since July 2006 by ASCSA staff with the assistance of teams from the Lambrakis Foundation and RACTI, University of Patras, in the digitization of materials from the Gennadius Library, ASCSA Archives, and Ancient Corinth and their presentation through an internet “cultural portal” and four multimedia educational modules. Further information, and eventually the database and "eucational modules" themselves, will be accessible in the Digital Library section of the website of the American School of Classical Studies at Athens. An interesting diiscussion between Harrison Eiteljorg, editor of the e-journal CSA Newsletter, and Judith Winters, editor of the e-journal Internet Archaeology is emerging here. I know there a members of AWBG who are planning electronic monograph. Comment from them and others is welcome here.